Buon girono. Ignorant and dishonest people complain that the Bible is "sexist", but that is not true. In reality, the value of women is affirmed in the Bible. For instance, Jesus went against the cultural trends of his day by speaking to, and even teaching, women. Quite a contrast from Islam: Beat them until they straighten up. Addendum: Where are the feminists, the supporters of women's rights, huh? I thought I would correct some lies in the original and have some fun with it. By the way, the real original source for the picture is here. Buona sera. I believe that I have reached a turning point in writing these articles, but more about that later. A jerk on the third floor of the apartment building cranks up his stereo at all hours of the day or night. He does not appear to have a job. I thought he was sponging off his girlfriend, but she ran off weeks ago. Probably couldn't stand the noise. The local constabulary are worthless, as are the complex's management. The crazy old crone next to the jerk on the third floor also seems to groove on making noise. Vacuuming the floor at night, pounding on the walls and floor at strange hours, pacing like an elephant at the Ant Stomping Festival and more. Weird. My favorite strange thing was hearing her yelling and cursing while I was coming home from work. Then I saw broken glass being flung out her patio door onto the sidewalk below. Neil's workplace is a huge modern international corporation based in the United States, employing tens of thousands of people. And yet, their management principles are rooted in the Industrial Revolution; an employee's value is based on production numbers of one sort or another. Sure, it's reasonable to establish guidelines for productivity, but some people are in fear for their jobs because of unreasonable demands — demands that have the expectation of reading corporate nonsense e-mails, perusing training documents, consulting with superiors, having meetings and all the rest of the typical corporate nightmare. I, for one, do not accept that my worth is measured by bean counters. My worth comes from the Lord and doing my best to please him. There ya go, three very irritating things that are on my mind. I have to admit that I take some satisfaction in venting on this stuff, capice? This article is getting negative, innit? I do not like being negative. Yes, some people positively get a charge out of conducting negativity, even if it's terminal... Are these electricity jokes doing anything for you? Well, it's true, some people only write and talk about negative things. They are stress puppies, living to whine and complain. Who wants them around? I certainly do not. There are people like those I have written about recently who live to hate, berate, mock and build themselves up by putting others down. They have little, if anything, constructive to say. The little bit of time that I spent reading their negative material brings me down as well, so I am going to go from seldom to never — or as close to "never" as I can get. We need to involve ourselves with positive people. That's a common psychological technique to help your attitude and deal with depression, so I am not going to repeat it here. What I need to do now, however, is say that we cannot avoid negativity altogether. Otherwise, problems would not be identified and solved. Problems come when negativity is excessive. If we spend too much time on glum reading material and bad news, it gets depressing. Even more so if we spend any more time than we have to in hanging around people who are too negative too often. Listen, I don't care who you are, this is true: "Finally, brothers, whatever is true, whatever is noble, whatever is right, whatever is pure, whatever is lovely, whatever is admirable—if anything is excellent or praiseworthy—think about such things." (Philippians 4.8 NIV) Think about good stuff more than bad stuff, capice? Now, I said that I believe I have reached a turning point in writing these articles. I have demonstrated in several posts that there are many Internet atheists who are irrational, vicious, hateful, incapable of reasoning, spiteful, morally bankrupt and brain damaged. Except for an article on occasion (and one or two are pending right now), I do not see a need to continue with it. Anyone who wants to see my material on those subjects can simply do a search on "atheist" or "atheism" in the upper left search box, and then they can see how I slapped some of the Internet atheists silly, but they still could not understand basic reasoning. I have educated the public about those animals, and I cannot fight with them any longer because they refuse to learn. It's like trying to teach a pig to sing. My time is better spent in other pursuits. Tweaked for wording later that same day. Buon giorno. How low can you get? 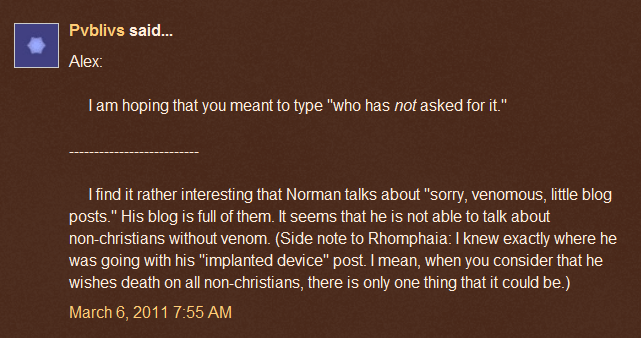 Norman the irrational, hate-filled troll made a remark to another irrational, hate-filled troll, completely off topic for the purpose of taking a cheap shot at yours truly, or will leave comments on Weblogs when I am not the topic of conversation. (I think he's still angry that I am his intellectual superior. But that is not a difficult accomplishment worth my bragging about.) Anyway, I get that. Being attacked, having petty Weblog articles written about what a bad man I am &c. is all a part of the territory. As can be expected, I went off, and demanded that he prove his assertion (a challenge that he has yet to meet). This adds to my belief that atheism leads to brain damage. It stupidifies, to use Matt Slick's word. But I think in that mix is hate. It's obvious that hate causes people to lose their focus and be unable to think clearly. Put the two together, and you get the two trolls that I am discussing right now. And others that I have discussed before. Again, I ask any intelligent, thoughtful atheists: Why do you associate with types like this? Personally, I suspect that your silence is tacit approval of their actions, but never mind about that now. So, I may add some remarks in a day or two in another post. After that, unless something changes radically, I am done with Norman. No more posts. 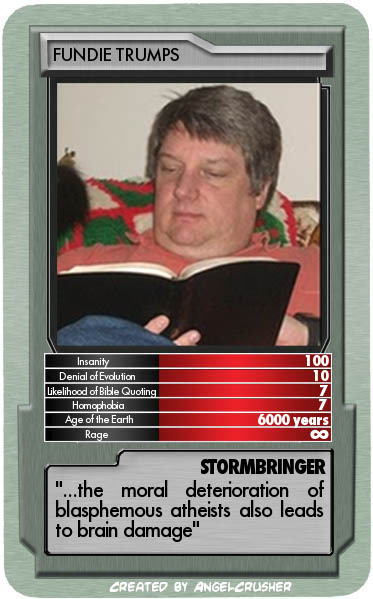 I've had about a year of his attacks and irrationality. He wants to reject the love of God and head for Hell, and I am done with attempting to interfere with that journey. To prevent whining, I am not allowing comments on this post. I sincerely hope that you come to know and experience and live in the evidence of the love of Jesus Christ one day. I also hope that you can gain a sense of humor and ability to deal with all of these issues lightly. But first, o dark and troubled soul, you must see yourself for what you are- you're lost. ...It is only The Shepherd who can 'find' you. He came to seek and to save, that which was lost. That's YOU. Jesus came to seek and save the lost. That's all of us until we receive him as Savior.